Hour fifteen opens with one of the most gloriously hopeful moments in the history of the series. Nadine, perky and shovel-wielding, marches down to Big Ed’s Gas Farm and in the most blissfully delusional yet definitively zen way possible…releases Ed to be with Norma. Blindsided by the possibility, Big Ed lumbers eagerly down to the Double RR…but Norma has to speak to Franchise Walter first. Ed, along with the audience, thinking Norma is going to slip through his fingers, sits there stoically dumbfounded. Meanwhile, Norma, in a twist of fate, announces to Wayne she wants him to buy out her share of the franchises so she can go back to just managing the Double RR and be with family. 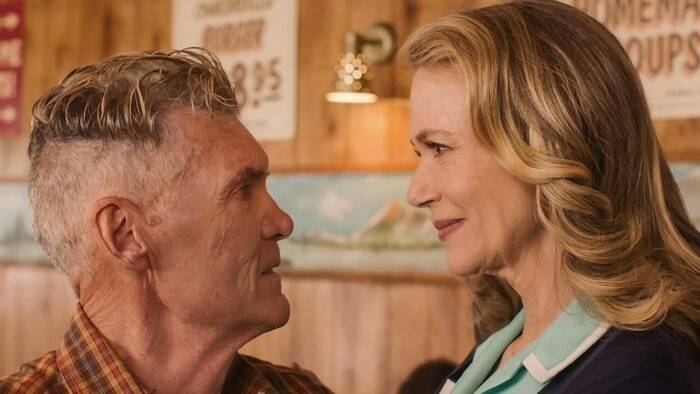 All the while, Lynch is playing a gut wrenching blues-rock song, echoing Big Ed’s fathomless deep heartbreak, his camera focused on the emotionally and physically weathered face of the ultimate sad-sack…but then…her hand…his shoulder…they turn to each other…he proposes…she says YES!!! !…they kiss…and the camera pans to clouds clearing to a clear blue sky. Clear, simple, hopeful, visual symbolism. A brief moment of brilliant joy in this world of truck drivers. Then…Bad Coop visits the Convenience Store and talks to the disembodied voice of Phillip Jeffries (coming through some kind of art-deco stereo coffee pot) and demands from Jeffries what the audience has been demanding too…WHO IS JUDY!? Alas…we’re not to learn the truth…at least not yet. Bad Coop then teams up with Bad Boy Horne (who tells Bad Cooper that his mother is Audrey…confirming what we’ve always known) and hops in a truck to head to…Las Vegas? Back in Twin Peaks, the Log Lady announces her death to Hawk. The gathering of Truman, Lucy, Andy and Hawk in the conference room is done with taste (something completely lacking in the horrid Caleb Landry Jones/Alicia Witt woods scene earlier in the hour) and simplicity…closing with a beautiful bit of painterly symbolism…the light going out in the Log Lady’s cabin’s window. Darkness gently descending. The Log Lady also warned Hawk to “watch for that one, under the Moon on Blue Pine Mountain.” And just WHO IS THAT? What say you, fellow Peakers? What was your favorite revelation in Hour Fifteen? This entry was posted in Art, Pop Culture, Psychology, Television, Twin Peaks - The Return: Complete Hour by Hour Guide and tagged Alicia Witt, Bad Cooper, Big Ed Hurley, Caleb Landry Jones, Catherine Coulson, David Lynch, Death, Deputy Andy, Deputy Hawk, Everett McGill, Harry Goaz, Kimmy Robertson, Kyle MacLachlan, Lucy Brennan, Mark Frost, Michael Horse, Nadine Hurley, Norma Jennings, Peggy Lipton The Double RR, Phillip Jeffries, Robert Forester, Sheriff Frank Truman, Showtime, Symbolism, The Log Lady, The Roadhouse, Twin Peaks, Wendy Robie.